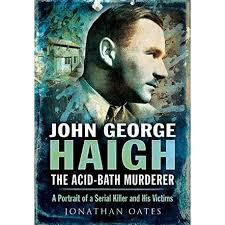 John George Haigh Research Papers examine the life of a man whose nightmares led him to become a serial killer. Research papers on serial killers are frequently ordered for criminal justice or psychology courses. Men like John George Haigh are studied so that criminal justice major understand the elements of what makes up a serial killer. John George Haigh’s was born to a conservative Christian family in which a repressive upbringing quickly lead to a life of rebellion in which he was fired from his first job for “dishonesty”. By age 25 he was arrested for swindling and spent fifteen months in prison. After his release from prison he worked as a forger and ended up back in jail a short time later. It was when he was released from prison a second time, the nightmares and hopeless spiral into despair began to overwhelm him to the point in which he acted upon his desire to kill. Haigh had been having nightmares in which he admitted to his psychologist that they were the source for his drive to kill. The dreams were always the same in which a vision of a dense, forbidding forest appeared before him. The forest was made up of crucifixes that changed to trees that dripped dew or rain. As he approached the trees in the dream he noticed the drippings were actually blood and the closer he came to the trees, the more they writhed and twisted in a motion of torture. Blood oozed from their trunks and a blurred figure passed from tree to tree catching the blood in a cup and telling Haigh to “drink”. It was because of this urging in his dream that Haigh felt he must kill in order to be released from the nightmare. In 1944 Haigh befriended William McSwan and his family. When William McSwan disappeared, Haigh explained to the family that their son was hiding out to avoid the military call-up and he had frequent news reports from their son who did not want to involve his parents in the cover-up. In 1946, Haigh murdered Donald and Amy McSwan in the same way in which he murdered their son one year earlier. Two years later, the nightmares of the blood in the forest began to overcome Haigh. Once again he turned to his friends to furnish him with relief from what Haigh described as, “a desire which demanded fulfillment”. Archie Henderson went for a drive with Haigh to their worksite at Crawley and met the same fate at the McSwan’s two years earlier. Later in the afternoon, Haigh lured Archie’s wife Rose to the same fate by insisting that Archie had fallen ill and needed him out by the Crawley worksite. Rose followed Haigh to the deserted worksite and met the same fate as her husband. Son of Sam - A Son of Sam research paper accounts for David Berkowitz’s life, and crimes committed in it. Jack the Ripper - A Jack the Ripper research paper discusses a sample of an order placed on investigating through books and articles who the real jack the ripper was. Paper Masters writes custom research papers on John George Haigh and examine the life of a man whose nightmares led him to become a serial killer.